Light from the sun setting reflected from water and melting sea ice just offshore from snowy coastal mountains. 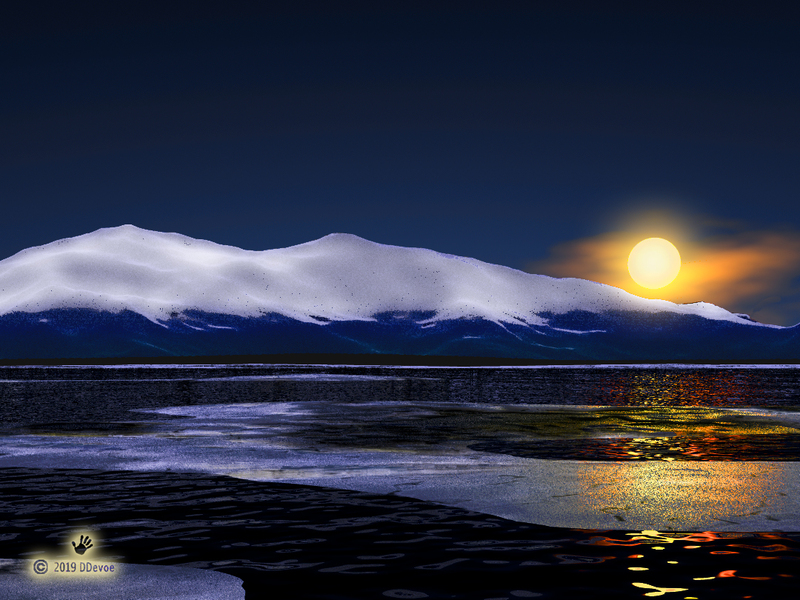 An orange sun is low on the horizon, last light at sunset, or the first light of sunrise, reflecting off snow-covered peaks. 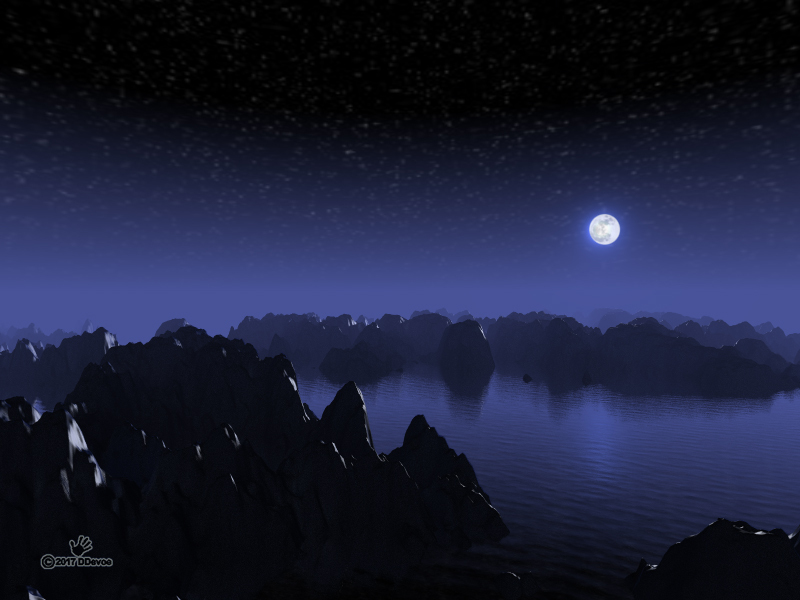 This image produced in Dogwaffle Howler’s 3D landscape renderer. Click on the image below for a full-size view. 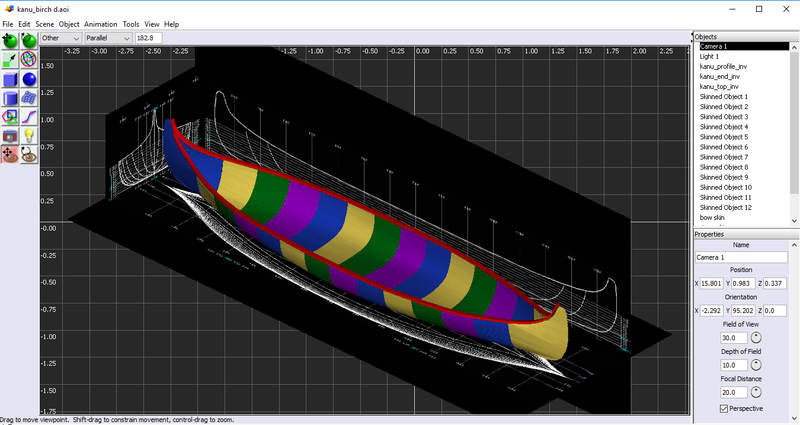 Current progress: Roughing out of the hull sections has been completed. That was both much easier and quicker than I had anticipated. I need to do a bit of tweaking where the geometry is rough, primarily on prow and stern, both of which, as opposed to the rest of the hull, were somewhat more difficult shapes to model than expected. I also reworked the gunnels resulting in a much better fit. It would probably be more correct to refer to these as frame stringers. Almost identical parts will sit atop of them; these additional parts will be the gunnels. Anyway; the hardest parts of the project, the basic frame and hull are complete. Everything else will be relatively easy, but time consuming. Joining the hull sections into a unified whole, and then thickening the surface so that “bump”, a 3D texture or roughness, can be assigned to it. While inner birch bark is fairly smooth, there is always natural variation in thickness and bumpiness resulting from the lenticels (slit-like pores). 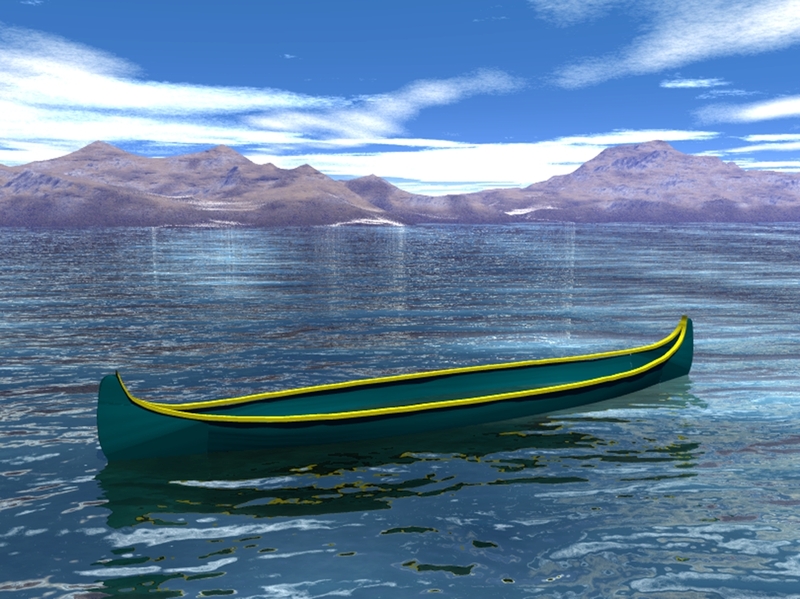 A second instance of the hull will be necessary for the texture of the inside of the canoe. The last task will be to make the ribs, thwarts (cross pieces), and a few odds and ends. Here’s a test render in DAZ Bryce to see what the model in its current state looks like in the wild. It floats! Next time: more tweaking of the geometry and birch bark and wood textures. 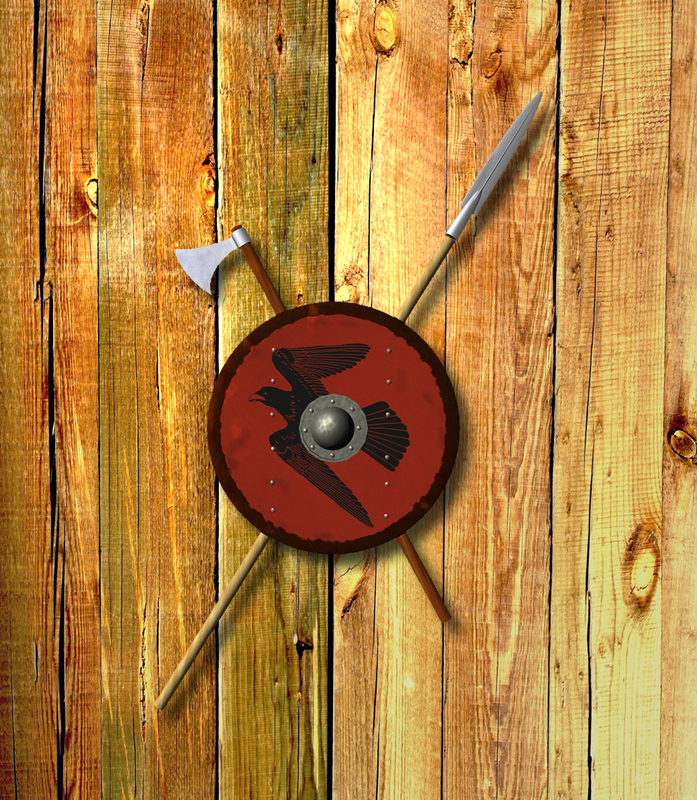 A 3D rendering of a Viking shield along with a battle ax and spear hanging on a rough wooden plank surface, perhaps the interior wall of a longhouse. The shield is decorated with a black raven (Corvus corax) painted on red leather. There are many misconceptions about the Vikings. For example, no horned Viking helmet has ever been found. Such a helmet would have endangered the wearer in combat. And dragon-headed ships were rare. Only one has ever been found. The dragon head did not survive, but the ship is decorated in such a way to suggest there was probably a detachable head. The stereotypes and cliches began with German Romanticism in the 18th and 19th centuries. The actual Vikings, or Norse, were much more interesting. Even the word “viking” did not denote a people, but a profession. The Norse would “go a Viking”; to sail in search of lands to settle, trade opportunities; and, if commercial conditions were not good, to steal anything that was not nailed down. Here I’ve rendered a Viking axe and spear, along with a shield, hanging on an interior wall of a longhouse. Click on the image for a full-sized view. Methods and materials used in the construction of Viking shields varied with place and time. This reconstruction is based on known examples. Norse shields, in contrast to those made by other groups were often made from relatively soft woods such as poplar and birch. Intentional or otherwise, this helped the shield absorb blow without failing. And, instead of a solid piece of wood, horizontal planks were joined – as is indicated by the bolt heads seen on the front of the shield – to prevent spitting along the grain. Metal for shield rims was difficult and expensive for early viking Age inhabitants of Scandinavia to obtain as they had to rely upon bog iron. As a result, to further reduce the possibility of damage the face of the shield was often covered by leather and a leather rim strip was added. Both absorbed blows, protecting the underlying wood. The bowl-shaped metal boss in the center protected the warrior’s hand. As usual, you can find a number of variations of this image, appearing on various backgrounds, at one of my Zazzle stores. A modified Mandelbulb 3d fractal which reminds me of the Idaho panhandle. There is only 1 fractal in this image. The second and third hills are merely copies of the first; the image was reversed for the second hill. Adjusting the color balance toward the blue and the addition of “fog” gives a sense of depth. An icy moon orbits a frozen world. You can decide which is which. 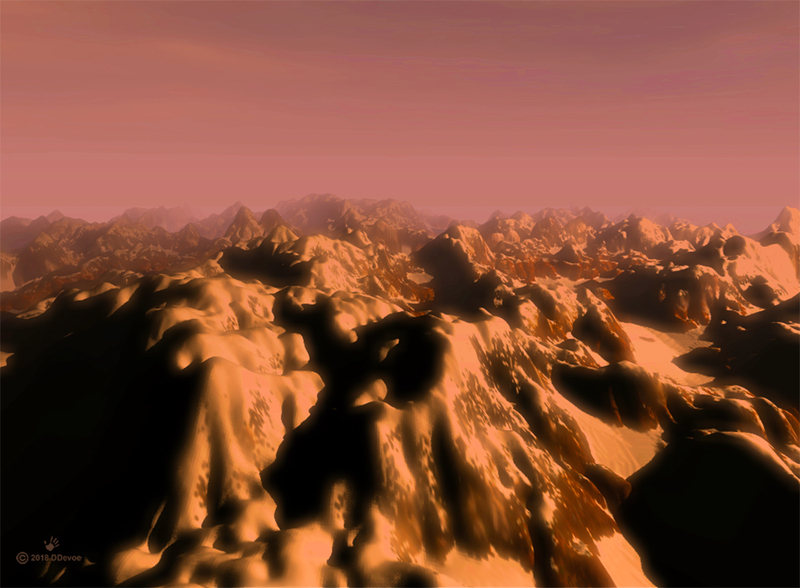 The mountains in the image above are merely a rendered 3D fractal. If you are not familiar with fractals they are never-ending patterns, infinitely complex patterns that are self-similar across different scales. In other words, as you enlarge a fractal you will see the same, or very similar pattern emerge repeatedly ad infinitum as you enlarge the original fractal. This is called expanding symmetry or evolving symmetry. You are already familiar with fractal patterns, the natural world is full of them. Take a tree, as a simple example. The pattern of the trunk and branches and secondary branches is repeated as you move to the scale of branches, secondary branches and twigs. Another example would be the tiny rivulets of rain or melting snow water running onto successively larger flows until they are a large river emptying into a sea. Physical laws dictate that flowing water moves in similar ways at all scales. The same thing is true for coastlines at any scale; similar patterns reappear over and over and over as you look at ever smaller scales. As a result it is practically impossible to actually measure the exact length of a coastline. So, enough with the heavy-duty science. You can find much more about the science of fractals on the Internet. I generally think of fractals as coming in 2D and 3D varieties. I do some work with both types, examples of which have appeared on this blog. 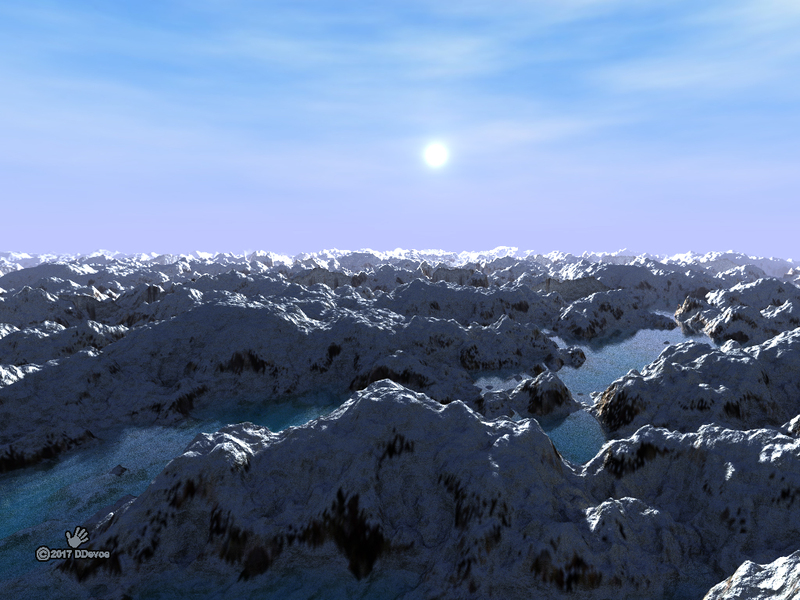 2D fractals are generally backgrounds or some other element; with the 3D fractals often being the mountainous terrain generated by various software packages. Then there are 3D fractals. I used a free software package called Mandelbulb to create the examples in this post. And one I like very much – a habitat on a rocky moon or asteroid. The fractal reminded me of the cartoon-like atmosphere of some of the stories by the great Polish science fiction writer Stanislaw Lem, author of Solaris, The Cyberiad, Tales of Pirx the Pilot, and many others. I added a few elements to complete the scene including a spaceship Pirx would have been proud to fly. Science and art! Cool, eh? You can do this too. An Aeroflot Tupolev (Туполев) Tu-104 passenger jet in flight over a foggy, forested, winter landscape. The Tupolev design bureau logo appears at lower left. The Tu-104 (NATO assigned the reporting word CAMEL to this aircraft) was the second jet airliner to enter service, the British de Havilland Comet having been the first. It was the sole jetliner in service from 1956-58, when the Comet was grounded after a number of crashes. The Tu-104 carried over 90 million passengers during its service life with Aeroflot (then the world’s largest airline). The aircraft was retired in 1986. A number of Tu-104s of various types were used for special applications, including weather research, and as a “vomit comet” reduced-gravity aircraft to parabolic flights allowing cosmonauts to experience short periods of zero gee. Aeroflot’s need for a modern aircraft with greater capacity and performance than the piston-engine aircraft it then operated by modifying the Tu-16 Badger bomber. The wings, engines, and tail surfaces of the Tu-16 were retained with the airliner, but the new design adopted a wider, pressurized fuselage designed to accommodate 50 passengers. The glazed, bombardier nose of the Tu-16 was also retained, giving the Tu-104 a distinctly military look. The interiors of Tu-104s built early on were said to resemble Victorian Pullman cars with ornate chandeliers, overstuffed seats, brass serving trays, and chain-flush toilets. But the aircraft, overnight transformed Aeroflot from a lowly-regarded, primarily domestic line, into a major international presence. Those Tu-104s I flew on had a much more utilitarian interior. Puppy Ray is a ray tracing filter included in recent versions of Project Dogwaffle. It can run in the graphics processing unit (GPU) of a computer. I have recently acquired a new machine which allows me to better utilize the GPU. Here are my first two experiments running Puppy Ray in the GPU. The first is a night scene. I have a particular liking for such images perhaps because I have spent so much time living in northern latitudes where winter nights are so long. I also like the bluish cast common to snowy scenes and the contrast between dark and light. And the lack of illumination can make successfully putting together a pleasing image can be a challenge. Then one when the sun is up, fjords. Water planes processed in Puppy Ray are semi-transparent, allowing for more realistic rendering; i.e. you can see down into the water. The refraction index of the water as well as wave height and frequency can also be fine-tuned.